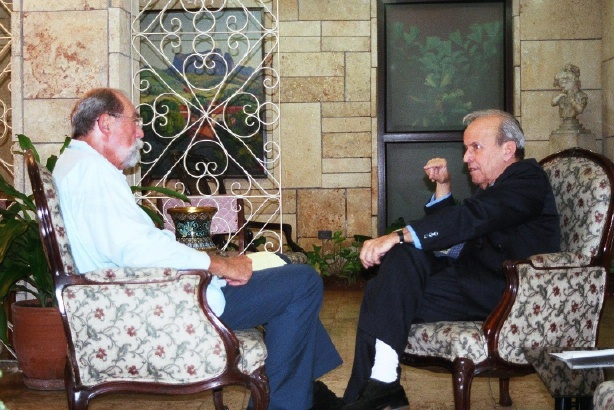 On June 29, 2005 Senior Fellow Wayne S. Smith met with the president of the Cuban National Assembly, Ricardo Alarcón, in Havana, Cuba to discuss Cuba and terrorism. Below is a summary of the interview. Smith: The US State Department, and specifically John Bolton, has said that Cuba embraces terrorism as a public policy. Does Cuba endorse terrorism? Alarcón: This question is actually one of the reasons why Bolton lacks credibility, because while Cuba is on the US list of terrorist states, Cuba has been, and continues to be, a victim of terrorism and there exists a history of acts against us that have been tolerated by US authorities. Moreover, Bolton cannot quote a single statement of terrorism committed by Cuba. Smith: What measures has Cuba taken to demonstrate its opposition to terrorism? Alarcón: Cuba has signed and ratified all UN and international treaties that regulate terrorism. Most importantly, Cuba cooperated with the UN Security Council with Resolution 1373, which was passed on September 28th, 2001 - just a few weeks after 9/11. Resolution 1373, drafted and introduced by the US, outlined steps to be taken to fight terror, including the need to develop bilateral and regional agreements. Cuba made specific proposals for a bilateral agreement to combat terrorism and human smuggling; however, the US was not interested in negotiating with Cuba - not even to fight terrorism. This is in clear violation of their own resolution and other anti-terrorism conventions. Then there is the case of Luis Posada Carriles, who is accused of masterminding the destruction of a Cuban civilian airline in 1976. Twenty years ago, following his escape from a detention facility in Venezuela, the Venezuelan court declared him a fugitive and asked for his return. In fact, Article 7 of the Montreal Convention of 1971 establishes a rule that when a person is found in a country and is asked to be extradited by another country because he is accused of involvement in an attack against a civilian aircraft, the second country is obligated to extradite him. If there is no extradition, there is one alternative: that country, without exception, must try that person there, as if the alleged person had committed the crime there. Posada has been in the US since March, and according to The Miami Herald, nobody was after him until May, when he was finally detained following a well-publicized press conference. He still has not been presented to a court of law to determine his possible extradition to Venezuela. Further, the administration has created another obstacle by arbitrarily considering his case as an illegal entry violation, which is a minor crime compared to the violation of Resolution 1373. What is the state of health of Resolution 1373 if its creator does not abide by it? Smith: If the US extradites Posada to Venezuela, will the Venezuelans send him to Cuba? Alarcón: We do not want him to be sent to Cuba. Venezuela has been asking for him since 1985. The crime has many complexities: Posada is a Venezuelan citizen, the plane was Cuban, the victims were Cuban, Guyanese, and Korean, and the plane crashed in Barbadian waters. When one of the co-authors of the explosion placed a phone call following his arrest, the number was for Luis Posada in Caracas, where Posada was later arrested. In sum, the Venezuelan ties to the case are clear and the trial should be held there. Resolution 1373 specifically states that in an extradition case for an alleged terrorist, political arguments will not by admitted by the state to whom the extradition case has been submitted. The US is in direct violation of this by refusing the Venezuelan request. What many Americans do not realize is that it is not Chavez who is asking for Posada; it is the Venezuelan Ministry of Foreign Affairs, which is taking these proper steps, just as it did 20 years ago. In a recent poll in Venezuela, Chavez had 60% favorable support for his policies. But on the matter of Luis Posada, Chavez has the agreement of more than 92% of the population. This is not a matter of left or right - it is an issue of the entire Caribbean community. This was the first major terrorist action in the entire Caribbean and was a real shock to everyone. The US is under a distinct obligation to take the appropriate legal actions, unless it chooses the third alternative, which is to destroy the conventions altogether. It is the strong preference of Venezuela, Cuba, and the Caribbean nations that Posada be extradited and the trial continue. Smith: Besides Orlando Bosch, are there other terrorists who have taken actions against Cuba, but are living freely in Miami? Alarcón: Yes, and not just against Cuba - against Americans too. An example is Ronnie Moffett, an American who was killed in Washington, DC. Recently, a number of documents were declassified by the National Security Archives, and there are clear implications of Bosch's involvement in the assassination of Moffett. Yet, he was never accused or interviewed about the case. In December of 1975, there was an explosion at the New York airport and 13 people died. The person guilty of that act and of a similar act at the Miami International airport was found in Santiago Chile with Bosch. It is not by accident that Bosch is free in Miami. It is not by accident that Posada reappeared in Miami. It appears that Miami is the place to be if you are a terrorist. Smith: President Bush has stated that anyone who harbors a terrorist is, in fact, a terrorist. Many Americans argue that Cuba is harboring American fugitives. How is this different? Alarcón: First, in the case of Joanne Chesimard: she is not a terrorist. She was accused and involved with a violent act in which a policeman lost his life. This is unfortunate, but this is not terrorism. Terror is a very specific crime. How can you compare killing in cold blood everyone in a civilian airplane to an incident in which a policeman gets killed? Chesimard was involved with the African American struggle of the 1970s. Incidents like that were common in those days. On the issue of extradition, Cuba and the US signed a bilateral treaty in 1904, which the US killed in 1959 when it refused to honor Cuban extradition requests for people who were accused or found guilty of assassinations, torture, embezzlement, or who were linked to the Batista regime. Since coming to Cuba, Chesimard has never been accused by the US of doing anything - violently or non-violently. Smith: Have any other fugitives committed any crimes since coming here? Smith: What about the issue of the members of two Colombian groups (FARC, ELN) and the Basque terror group ETA who are residing in Cuba? Have there been any problems with the Colombian or Spanish governments? Alarcón: With regard to ETA, we were actually asked by the Spanish government if we would receive members in Cuba. Since being here, they have done nothing and it has been a non-issue for both the Spanish Populist Party and the Socialist party, who have never complained. The Colombian governments, foreign minister, and the military leadership have expressed recognition that members of FARC and ELN are in Cuba. We have the full consent of the Spanish and Colombian governments to house these members. Smith: It appears that in Miami there is a growing population of Cuban-American moderates who want a more productive relationship with Cuba. Is the Cuban government prepared to work with these moderates and meet them halfway? Alarcón: Cuba is willing to contribute to these positive developments; however, we have to be very cautious because this is risky work. Many Cubans have been killed in America. An example is Carlos Varela, a 25-year-old who was assassinated in San Juan, Puerto Rico 26 years ago because he was one of the first who tried to organize Cuban-Americans to visit their own country. Although the act was claimed by a terrorist organization headed by Orlando Bosch, nobody has ever been condemned for the act. Another example is the Cuban Five who were detained and have been in prison in the US since December of 2001. Two of the five were born in the US. What was their crime? Opposing anti-Cuban terrorism in Miami. When the Attorney General of Miami gave one of the Five, René Gonzalez, his sentence (which was the maximum possible sentence), he prohibited him from going to "places were individuals and groups such as terrorists are known to frequent;" meaning that Gonzalez was not allowed in Miami. The Attorney General recognized that the government knew of individuals or groups of terrorists that are in Miami. This is an important issue for Americans. Some of the high-jackers from 9/11 were trained in south Florida. The FBI was not looking for people involved with 9/11, but rather people involved with anti-Cuban terrorism. President Bush states that "either you're for or against terrorism." There is no middle ground. Your Commander in Chief is pardoning terrorism and is punishing his people in the process. Smith: There are some who think that Cuba does not really want normalized relations with the US - that it is better for Cuba to have the US as an antagonist. Alarcón: To those people I say: change the policy - maybe just for a short period of time - and see what will happen. We are interested in having normal relations and having the embargo lifted. In fact, we have been flexible on the position of the embargo. We have agreed to do agricultural trade with discriminatory conditions - including cash only, payment in advance, and only the ability to buy, not sell. We could have easily said "no one-way trade." But I am optimistic for a number of reasons. As you have said with the title of your book, The Closest of Enemies, we are neighbors. We have many of the same interests and we currently share information about tropical storms and weather, drug trafficking, human smuggling, and terrorism, as requested by Resolution 1373. The problem is that many Americans are not fully informed about terrorist activities against Cuba and the US dual policy of being tough on the fight against terrorism elsewhere, while protecting terrorists in Florida. I am positive that Americans would not be happy if they knew about the Cuban Five. If they knew, the Five would be released. It is not just in the interest of the American people for a changed policy, it is in the interest of Americans and Cubans, including the majority of Cuban-Americans. In the not too distant future more Americans will realize that a fundamental change of policy is necessary and we will live to see that day. Smith: And on that optimistic note, I think we will close the interview. Thank you for your time.